Recorded in various spelling, this is an English locational surname. 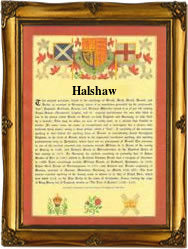 It originates the village of Halsall in the county of Lancashire near the town of Ormskirk. The name is recorded as Heleshale in the Domesday Book of 1086 and is believed to derive from the pre 7th century personal name meaning a hero, and halh which can have a variety of meanings from literally a house, to a corner of land, a small valley or recess, or even a cave! In effect it is some sort of place owned or occupied by a man called Haele. However it would seem that over the centuries given a good dose of thick accents and none existent education, the surname like so many others, has developed a number of variations. As such the modern spellings would seem to include Halsall, which is far and away the most popular, Halsell, Halsaw, Halshall, Halshaw, Halsoll, Halsull, and possibly others. Examples of recordings include Ann Halsall of Halsall, a widow, in the Wills Record at Chester in 1574, Robert Halsoll at Ormskirk, Lancashire, on January 24th 1655, and Richard Halshaw at Hale Barnes in Cheshire, on February 1st 1660. The first recorded spelling of the family name is shown to be that of Gilbert de Halsale. This was dated 1292 in the charters known as the Placita de Quo Warranto for Lancashire, during the reign of King Edward Ist 1272 - 1307. Surnames became necessary when governments introduced personal taxation. In England this was sometimes known as Poll Tax. Throughout the centuries, surnames in every country have continued to "develop" often leading to astonishing variants of the original spelling.